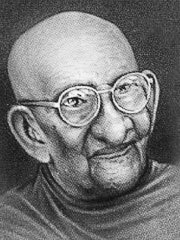 Venerable Balangoda Ananda Maitreya (August 24,1896-July 18,1998), a Sri Lankan scholar-monk, was one of the great personalities of Theravada Buddhism in the twentieth century. He was believed to have achieved through his meditations the highest level of spiritual development within the Sri Lankan sangha (Buddhist monastic order). However, he lived a modest life in a secluded monastery, and so is little known outside his native country. Ananda Maitreya wrote nearly fifty books on sutras (scripture), vinaya (monastic discipline), and abhidhamma (metaphysics), and on Pali and Sanskrit grammar. His book, Sakyasimhavadanaya hevat Buddha Carita (The Life of the Buddha), is considered a textbook. Unusually for a Theravadin teacher, he publicly studied practices of other traditions, especially esoteric yoga. Ananda Maitreya was known to have met on at least several occasions with Shoko Asakara, founder of the controversial Japanese group Aum Shinrikyo, and to have praised his achievements in meditation.